Her choice of tiara came as a surprise to many fans of the royals. 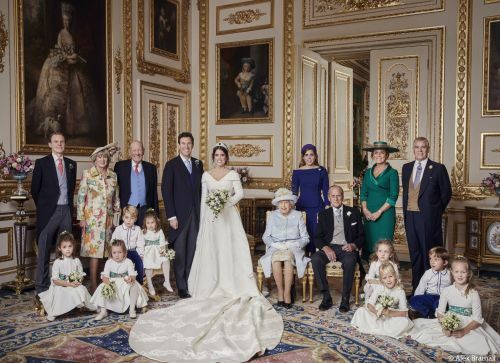 Princess Eugenie and Jack Brooksbank marked their wedding day at Windsor Castle , releasing four official royal wedding portraits on Saturday , one day after their nuptials. Taken by fashion photographer Alex Bramall, the shots were taken after their beautiful ceremony at St. George's Chapel - two with family and their bridal party in the castle's White Drawing Room, a third unique shot taken in the Scottish State Coach following their procession and a fourth revealing Eugenie's second bridal look just before their evening reception at Royal Lodge.